Connection volume seems to be a pretty simple combination of geography (we know more people near us) and population density (we know more people in big cities because big cities just have more people). The maps are surprisingly similar for both call and text volume. Should I have expected them to be different? Maybe not, but I did. Of course, there are also a few weirdnesses. 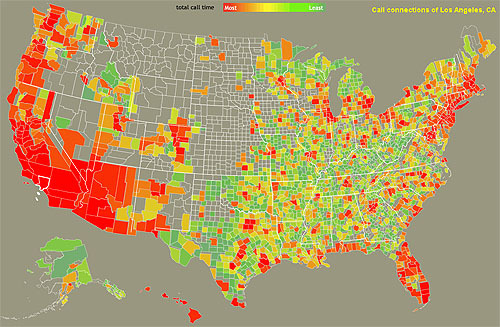 Why so many calls and texts to Codington County, South Dakota, and Tulsa, Oklahoma? Big call centers? What about Fayette, Tennessee?